Rates for parking inside the Fair Park gates may vary during special events. Parking is also generally available adjacent to Fair Park in privately operating parking lots. Please call 214-670-8400 if you have any parking-related questions. There are dedicated bike racks at the Gexa Energy Pavilion concert facility and at the DART Fair Park light rail stations both on Parry Avenue and at Martin Luther King, Jr. Boulevard. There is no designated parking just for larger vehicles. Please inquire regarding parking preferences with a lot attendant. Wheelchairs and motorized wheelchairs are always welcomed in Fair Park. Service animals are permitted. Lost property will be turned into Public Safety. See security staff for more details. 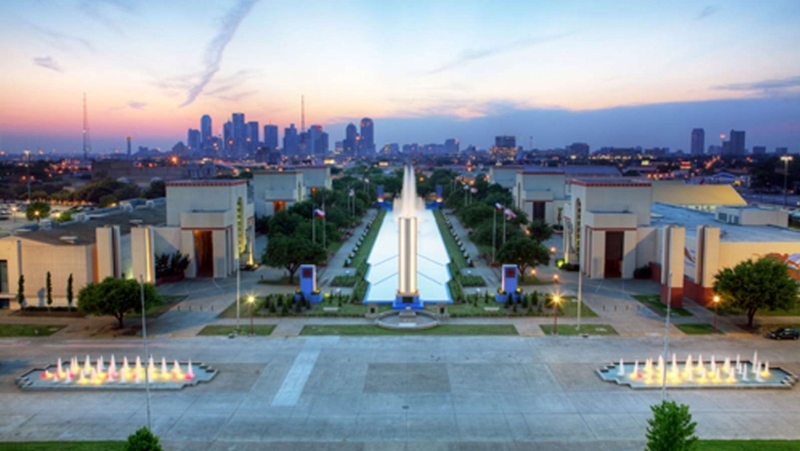 You are welcome to bring your own food or beverages in Fair Park, although some museums and buildings may not allow you to bring food or drink inside facilities. You may bring coolers or ice chests, but they are subject to search. Alcohol, glass containers, and metal knives and forks are not allowed. Before television – and long before the Internet – world’s fairs were a means of introducing the public to new products, new technology and far away places. In 1936, Texas celebrated the 100th anniversary of the Texas Republic with a world’s fair in Dallas. Texas’ history, economy, flora and fauna were portrayed in the building, statues and murals designed for the event – all constructed in Art Deco style. Fair Park is the only intact and unaltered pre-1950s world fair site remaining in the United States – with an extraordinary collection of 1930s art and architecture. Today, the 277-acre park and its cultural, educational and sports facilities play host to more than seven million annual visitors.